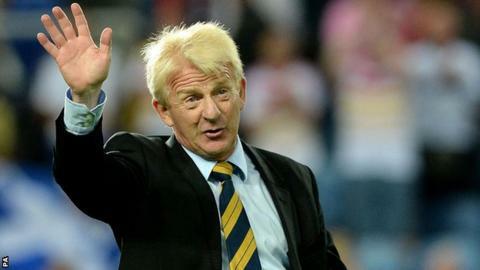 Gordon Strachan hopes that spending time with the Scotland Under-21 squad will help his preparations for the 2018 World Cup qualifying campaign. The national manager's senior team failed to reach the Euro 2016 finals. "We elected not to have a friendly match in November after the disappointment of not reaching the play-offs," said Strachan. "But this is a good way of assessing those players in the under-21 squad with a view to World Cup qualifiers." Strachan will join Ricky Sbragia's coaching team for the Uefa European Under-21 qualifier against Ukraine at St Mirren Park on 13 November. And he will be hoping that others impress in the same manner as Hull City left-back Andy Robertson, who has dropped down to the Under-21s to help the team reinvigorate their own qualifying campaign. Scotland are fourth in a six-team section with four points from three games, seven points behind leaders Iceland who have played two games more. "I'm really looking forward to helping Ricky and taking a closer look at the younger age-group of players," Strachan told the Scottish FA website. "It's an important qualifier for the Under-21s and I will be out on the training pitch and there to help out the backroom team in whatever way Ricky requires. "The main focus for the players should be to beat Ukraine and maintain a challenge in the group, but I have said often enough that the door is open for any player who impresses over a period of time, regardless of age." Strachan pointed to Robertson, born in 1994 and thus eligible for the Under-21s, as one example of someone given the opportunity at senior level on the back of good club form. The former Dundee United defender made his full Scotland debut in March 2014 and has now won eight caps. "We have introduced some of the younger players to the squad already, such as Callum McGregor, Ryan Gauld, Lewis Macleod and, most recently, Graeme Shinnie," added Strachan. "But the Under-21s should look no further than players like Grant Hanley, Jordan Rhodes, James Forrest and Andy Robertson to see that it is possible to force yourself into the senior squad and stay there if you are performing well enough and consistently enough for your clubs. "For that reason, both Ricky and I are pleased that Andy will be joining us for this match. "It is a match that we want to win and to do that we need the best players available. "Andy is still eligible and at his age it is important to play as often as you can and build-up that experience."